When it comes to hiring the right termite control company, you might not be sure where to start. After all, choosing the wrong one could mean the difference between you knowing your home is free of termites and your family having to move a few years down the road because there is so much damage from termites that your house is no longer safe. Yes, not all exterminators are created equal. In fact, some of them are only focused on one thing: the sell. They will speak fast, make promises, and ask swiftly for you to sign on the dotted line without even the slightest plan to entirely rid your home of the termites that ail it. A good exterminator, on the other hand, knows what sort of conditions cause termites to infest your home and will inform you of the areas in your home that are making it so appealing to the pests. Below you can find just a few of these things so that you can make sure that your exterminator actually does know what he is talking about. If you have a fireplace in your home, it’s likely that you keep a woodpile in your backyard or somewhere on your property. If this is the case, you may want to reconsider. A woodpile is one of the easiest ways you can attract termites to your home. We would suggest that you move your firewood at least 20 feet away from your home to ensure that you aren’t encouraging termites to infest your space. While we know it is an absolute pain to clean out the gutters on your home, if you want to prevent termites this is something you’re absolutely going to have to do. Termites are extremely attracted to moisture and the water that pools because of clogged gutters entices them more than you could possibly know. Be sure to have your gutters cleaned out often to prevent the arrival of termites in your home. This might seem like a weird addition to this list, but having tree stumps or dead trees in your yard can lend to termites showing up on your property. Rotting wood acts as termite fuel and even though it is on the exterior of your house, the likelihood that they will eventually end up inside is high. If you have a lot of mulch used in your landscaping, it’s important to have your home checked for termites more often than you would otherwise. Mulch acts as a fantastic food source for termites as it retains a ton of moisture. Make sure that you are monitoring existing mulch for any signs of termite activity that could be possibly taking place below the surface. Do you have trees in your yard that come into direct contact with your house? If so, this could be an easy way for termites to travel from the outside of your home into the interior. Tree limbs also work to block sunlight which can lead to excess moisture on the exterior of your home, making it even more appealing to termite colonies. 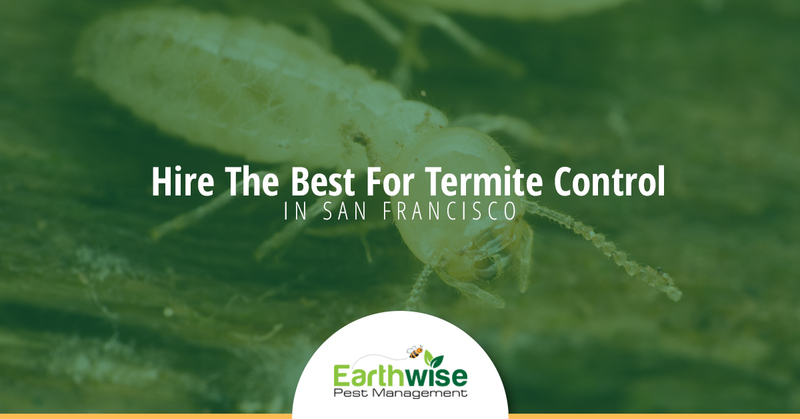 If you are worried that you may have a termite problem in your Sacramento home, do not call anyone besides the expert exterminators at Earthwise Pest Management. We know how to identify and get rid of termites in no time at all. Not to mention, you won’t have to worry for a second that our inspection wasn’t thorough enough. Plain and simple, it doesn’t get more in-depth than the inspections we provide. Call us today to set up a termite inspection at your home!